As the Chicago Cubs inch closer to their first World Series appearance in 70 years, the sheer improbability of the team’s success is starting to draw attention from baseball fans nationwide. Case in point: Back To The Future co-writer—and Cardinals supporter—Bob Gale, who agrees with everyone who thinks it’s kind of crazy that he predicted this would happen back in 1989’s Back To The Future Part II. “I thought, ‘Okay, let’s come up with one of the most unlikely scenarios we can think of,” Gale told the Chicago Daily Herald, referring to the Cubs’ cinematic World Series victory, which he penned with the help of director Robert Zemeckis. 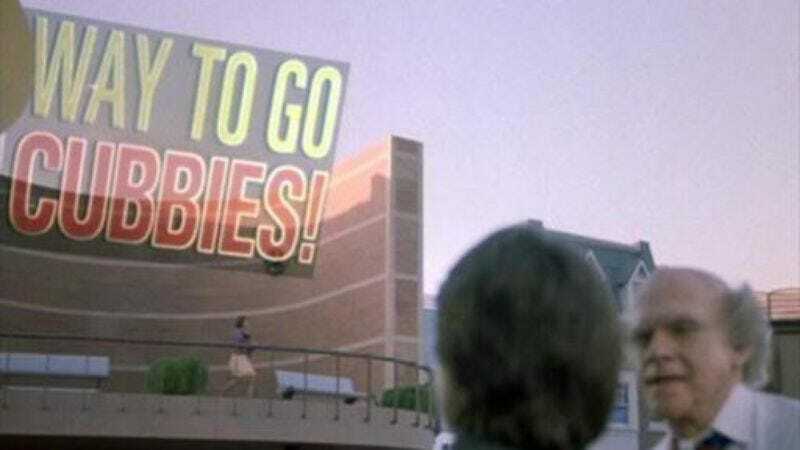 But now, that jape is on the verge of being true—nearly, anyway, since the MLB’s schedule means that a potential Cubs championship couldn’t take place exactly on October 21, 2015, the day Marty McFly arrives in the future—suggesting that Bob Gale is secretly a time traveler, or maybe that the God of Baseball just enjoys conspiracy-minded Facebook posts.